AfreecaTV has announced the round-of-32 groups for the upcoming GSL Code S Season 3 tournament. 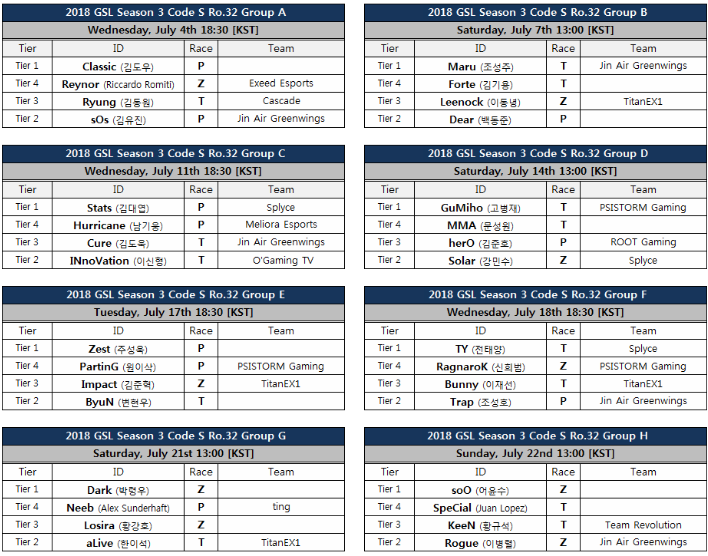 Code S Season 3 will commence on Wednesday, Jul 04 9:30am GMT (GMT+00:00) with Group A, featuring Classic, Reynor, Ryung, and sOs. Mod edit: Poll moved to OP. Group D is the clear group of death to me. Because of the tiers almost all the groups have two very good players, but herO makes the third for group D since he managed to fall to tier three by inexplicably failing to make it through the qualifiers last season. I hope MMA will go through his group this time even if like you ZigguratOfUr I do think that is the group of death ! Glad to see sOs in group A so I don't have to wait too long to see him play but it's not an easy group to be honest. Neeb has a decent chance, his group kinda is a group of death too. That kinda depends on Losira though. Group D is the Group of Death; despite MMA not being too impressive, Gumiho, herO, and Solar are pretty damn even. Which is a lot more than we can say for most of the other groups. Group E is also pretty stacked but Zest is a clear step up from the others. Foreigners got a pretty bad draw, methinks. Special is toast, Reynor likewise, but Neeb might have a chance. Assuming he doesn't play like he did against Silky, ofc. 2017 Neeb would have a good chance but 2018 Neeb is a long way from that. TY for a first time is not in a deadly group. Of course MMA is back in the elite and that is the most important event. I don't think he will be able to get out, Gumiho's TvT is really solid no matter he lost barely to TY in the semifinal. I can't tell how good herO and Solar are right now, actually Solar did not impress that much for the last 2-3 months. For sure I can tell that the favorite tosses will be back in the higher rounds, so I am calm for them. Actually the first group could be one of the most exciting to watch, love Ryung and he always shows good matches no matter how far he will go or lose and of course sOs and Classic can demonstrate some top PvP skills. This is the time of the year when Innovation is getting extremely good so we shall see. It depends if Maru shall keep his god mode right now. Last season was almost perfect with the players inside, this season is even better! Parting - the most attractive player in the e-sport is also back, rather I hope he shall not act emotionally like the way he streams. No real group of death this time around. Cure with the bracket luck as usual too. Can´t wait for parting crispy builds one again. He shown protosses the way on the first LOTV DH against solar. He almost made it. (Vote): There is no group of death. poor Special and Reynor, Neeb got lucky with the drawing, he will qualify hopefully. Other than that is kinda clear in all groups who are the 2 favorites. These are really strong groups, damn.